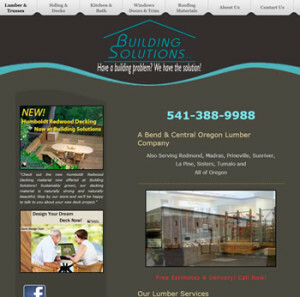 Building Solutions in Bend, Oregon serves the needs of builders, contractors and retail homeowners throughout Central Oregon. From lumber and framing to kitchen and bathroom cabinets to window and door supply, Building Solutions partners with customers to deliver the knowledge, experience and materials required for their next construction project. Building Solutions turned to Boise-based Peyron Strategic Communications to assist with a complete overhaul of their outdated logo and website. Peyron’s branding and marketing team worked closely with Building Solutions to understand the look and feel they wanted to achieve with the new brand. A clean, modern logo was needed — one that would stand strong in black as well as reversed in white and work well across many mediums, from business cards to truck wraps. In addition to responsive design, more functionality and clean visual appeal, Building Solutions also wanted control of their website. Rather than continuing to pay for every little change they needed, Building Solutions wanted to freely add content and photos from the many community events they sponsor. They also wanted a website that was focused on delivering their valued customers the information they needed, from photos to warranties to credit applications. After agreeing on a new sitemap and design, the marketing experts at Peyron Strategic Communications worked to build a new website from the ground up. In about a month, the Peyron marketing team had written new SEO-focused content, collected and optimized images, and customized a WordPress design that embodies the new Building Solutions brand and puts them in control. Peyron’s team also integrated sticky navigation, Google analytics, an XML sitemap, webmaster tools, and created social media pages to expand the new site’s reach. The old website was eight static pages with very limited functionality and no responsive elements, so it didn’t work well with today’s mobile devices and tablets. The newly developed website is more than 20 dynamic pages built on a responsive framework optimized for multi-device use. 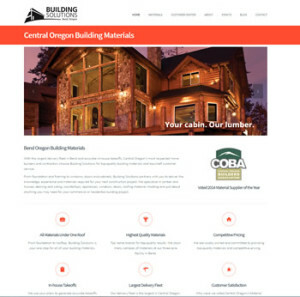 The new site lets Building Solutions quickly add and edit content as needed and emphasizes the many visual aspects of their Central Oregon building materials, using large image sliders and videos integrated throughout the content.